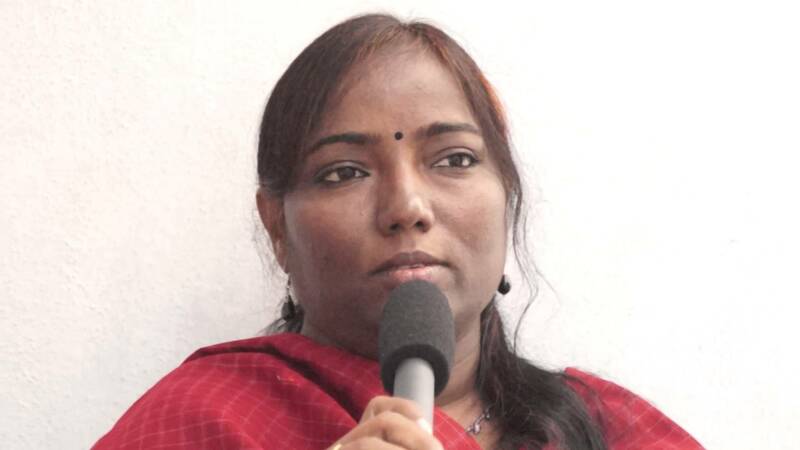 Karimnagar-based Sujatha Surepally has been facing death threats and online harassment since she wrote a Facebook post alleging an RSS attack on Dalit-Bahujan students at Satavahana University. Karimnagar (Telangana): Telangana’s Karimnagar district has become the latest battleground in the clash between Dalit-Bahujans and the right wing. Over the past week, a now-familiar template of contestations over freedom of speech, assertion of identity and nationalism has unfolded at the Satavahana University. Sujatha Surepally, an academic-activist who was only peripherally involved in the initial incident, has unwittingly become a target of a vicious online campaign. On December 25, a group of Dalits belonging to the Bahujan Vidyarthi Parishad burnt a piece of paper outside the campus with ‘Manusmriti‘ written on it, as part of the wider Dahan Diwas against the text observed on that day. At the same time, BJP activists were leading a march to commemorate Atal Bihari Vajpayee’s birthday. The two groups clashed outside the main gate of Satavahana University and stone pelting followed, with the BJP alleging that the Bahujan activists also burnt a hoarding of ‘Bharat Mata‘, which has been denied by the Bahujans. When the police arrived at the scene, they arrested people from both groups. Surepally, who teaches at Satavahana University was not even present in Karimnagar at the time of the incident, a fact that was confirmed by a source in the town. She was in Hyderabad that day, but she posted a message on her Facebook wall saying that the RSS had attacked Dalit-Bahujan students at Satavahana University. Her post went viral. Within hours, the online backlash began. By the evening of December 25, local news channels were allegedly reporting that pictures of Bharat Mata had been burnt and that Surepally was the instigator. Online trolls dug out her photograph and circulated it on social media, stating that she was ‘anti-national’ and had Naxalite connections. A Facebook post in Telugu by someone called Pillala Manmadha Vedhas carried her photograph and identified her by name. The post says she burnt photos of Bharat Mata, has Naxalite connections and is leading students astray. The post was shared 138 times (when last checked) and attracted all kinds of vile abuse and death threats directed towards Surepally. One person, Murali Kishore, commented that “it’s time for her to go”. The mobile phone of Bandi Sanjay, a BJP spokesperson and party functionary from the district, was switched off when he was called for a comment. Surepally had reportedly lodged a complaint with the Karimnagar police commissioner against Sanjay and the women and minority wings of the RSS for defaming and harassing her. Press reports from Telangana state that the commissioner of police of Karimnagar, Kamalasan Reddy, thinks “no crime has been made out” and the online abuse amounts to defamation. “It amounts to defamation. When somebody tries to blame her, she has to apply to the court of law for defamation,” the New Indian Express quoted Reddy as saying. Multiple calls to Reddy went unanswered. Surepally is not just a Dalit activist. She is a rallying force in the environmental movement in Karimnagar, which is opposed to extractive industries, particularly granite mining, which is a Rs 3,000 crore per annum industry. She has also been at the forefront of the movement against student suicides on campuses, which has taken a particularly brutal toll in Telangana. The academic also had a key role to play in the arrest of a local strongman who was threatening two Dalit men. No formal groups have rallied against Surepally except for the Karimnagar unit of the BJP, including its Dalit, women’s and minority cells. The most vicious parts of the campaign against her have been online. Demonstrations of solidarity in favour of Surepally have been organised in Hyderabad by Dalit groups, women’s organisations and Left parties. Surepally herself thinks that an attempt is being made to silence her voice because she is a Dalit woman who is not afraid to speak out, besides being a writer and an academic. She said that though the viciousness of the online campaign has rattled her, she is not afraid to go back to Karimnagar.